Two young faculty members at the University of California, Santa Cruz, have received major grants for stem cell research from the California Institute for Regenerative Medicine (CIRM). The five-year grants totalling $4.5 million will support the research of Bin Chen, assistant professor of molecular, cell, and developmental biology, and Camilla Forsberg, assistant professor of biomolecular engineering. The grants are among 22 New Faculty Awards announced yesterday by CIRM to fund stem cell research at various California institutions. UCSC has now received a total of more than $9 million from CIRM to fund the campus's growing stem cell research program. "It is really remarkable how successful we've been at getting started in this new area of research," said Stephen Thorsett, dean of physical and biological sciences at UCSC. "Our proposals to CIRM have garnered more funding than those of any other institution that doesn't have a medical school." Stem cell research has enormous potential to produce new therapies and cures for a wide range of diseases. Stem cells are unspecialized cells that are able to renew themselves indefinitely and can also differentiate into specialized cell types with specific functions, such as a nerve cell or liver cell. Eventually, stem cells may be used to replace damaged or dysfunctional cells in the body with healthy new ones. The latest CIRM grants are intended for scientists in the critical early stages of their careers as independent investigators and faculty members. Designed to encourage and foster the next generation of clinical and scientific leaders in stem cell research, the New Faculty Awards support research across the range of stem cell types--human and animal, adult and embryonic. 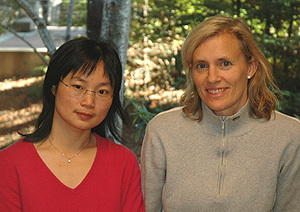 The work supported by Chen and Forsberg's grants will not involve human embryonic stem cells. Forsberg, who joined the faculty of UCSC's Baskin School of Engineering in July, is studying how stem cells make the decision to become a particular type of mature blood cell, and how this process can go wrong to cause disease. She uses special lines of mice genetically engineered to allow her to track the development of mature blood cells from their stem cell progenitors. Forsberg said two of the fundamental challenges in using stem cells to treat diseases are to get the cells established in the body, and then to direct the cells to differentiate into the desired cell type. "Our long-term goal is to provide a comprehensive understanding of stem cell fate decisions and, ultimately, to be able to manipulate those decisions after transplantation of stem cells into the body," Forsberg said. Chen's research focuses on the development of corticospinal motor neurons, which control voluntary muscle movements and are affected in neurodegenerative diseases and spinal cord injuries. Earlier this year, she received one of the first CIRM research grants: $500,000 for research on embryonic stem cells (see press release). She also uses mouse models to study how stem cells differentiate into specialized neurons. "One of the most exciting possibilities in stem cell biology is the potential to replace damaged or diseased neural tissues affected by neurodegenerative disorders," Chen said. "Neurons derived from stem cells provide a potentially limitless supply for cell replacement, if we could guide stem cells cultured in a laboratory toward specific differentiation pathways to produce specific types of neurons." Chen's new grant will provide research funding of $436,000 in the first year and a total of $2.2 million over five years. Forsberg's grant will provide $467,000 in the first year and a total of $2.3 million over five years. Forsberg noted that the awards were the result of a team effort involving a large group of people working to build UCSC's stem cell research program. The interdisciplinary program involves researchers in biology and engineering, as well as contributions from humanities faculty in the area of bioethics. "This is team building at its best. I feel very supported by the campus and the engineering school," Forsberg said. Other awards UCSC has received from CIRM include a $1.2 million training grant in 2006 and a $2.7 million grant in June 2007 to fund a stem cell research facility, as well as seed grants to start new research projects. CIRM was established in 2004 with the passage of Proposition 71, the California Stem Cell Research and Cures Act. The statewide ballot measure, which provided $3 billion in funding for stem cell research at California universities and research institutions, was overwhelmingly approved by voters, and called for the establishment of an entity to make grants and provide loans for stem cell research, research facilities, and other vital research opportunities. The CIRM governing board has now approved almost $260 million for research grants at 22 California institutions. More information is available on the CIRM web site.